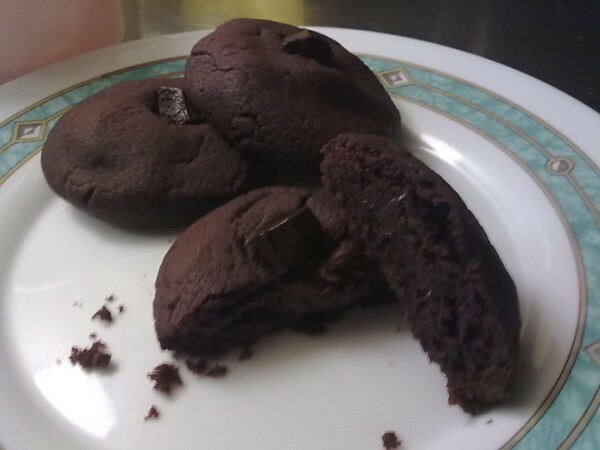 A recipe for chocolate lava cookies. 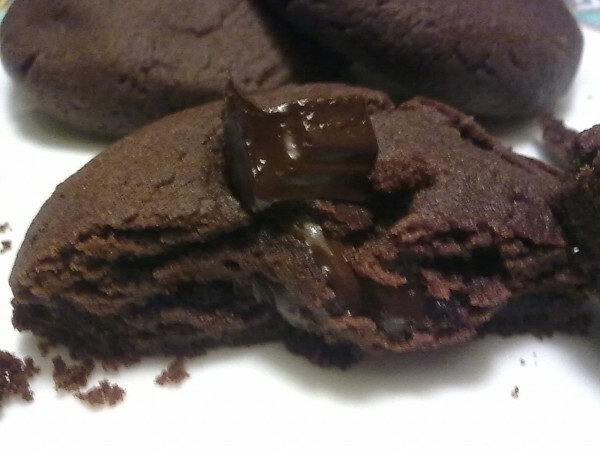 Soft brownie-like cookies with a gooey chocolate center. This is my mom's recipe which she made by mixing 2-3 others we found online, since none of them worked for us 100%. Follow this to the letter cause unless you mess it up, there's no way these will fail. They've already gone through quality check by a few people and all of them loved these. If you use the ingredients I name, these are also lactose free. - Not softened melted butter.Liquid margarine. Milk-free and not too watery. - Cocoa powder means pure cocoa. The bitter kind. Not those mixed with sugar. - Never used milk chocolate so no idea how it would turn out. 50+% cocoa is awesome. Trust me. It's also ok for those with lactose intolerance, but do check for milk just in case. Mix the dry ingredients in one bowl after passing them through a sift (flour,vanilla sugar, baking powder, cocoa powder). In another bowl, beat the sugar and margarine with a mixer for 5 minutes. It's a long time, but necessary. Add the egg to the margarine/sugar and mix for another 2 minutes. Add half of the mixed dry ingredients to this liquid mix and stir with a spatula or something. Not the mixer. This needs to be gently done. Keep adding the rest of the dry ingredients and stirring. The final dough should be firm enough to mold into little ball shapes with your hands, without any of it sticking on but also without it crackling. 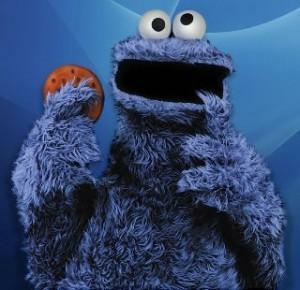 One full tablespoon of dough per cookie. Mold into a ball and then break it in half with your hand. Press the center of the one piece with your thumb so that you form a tiny bowl-looking dough "nest". Add a piece of chocolate and then cover it with the other half of the dough ball and mold until you have a whole round piece again, with the chocolate inside. Pat it down a bit to be a bit flatter. Lay the cookies on a tray covered with baking paper and bake on a middle shelf for 8-9 minutes (depending on how big they turned out). This is VERY important. Track the time. Even half a minute more or less will make a huge difference! 8-9 minutes is the safe zone. Enjoy and here's some pics to get your drool going even more! God's Quiz Season 2 Has Started! Initial Thoughts on "God's Quiz"